Journalism lecturer Hannah McMahon visited Kazakhstan to share her knowledge and expertise with international young news reporters of the future. Joining the Teesside University academic on the trip was BA (Hons) Journalism student Jake Graham. They spent two weeks teaching at a journalism summer school at Kazakh Ablai Khan University in Almaty, Kazakhstan. Teesside University journalism lecturer Hannah, who draws from her own industry experience working as a BBC reporter and freelance journalist, said: 'We worked with students to produce multimedia content for a website. She added: 'Jake was chosen for the trip as he displayed the essential skills to be able to help teach and during his degree he has also shown a real ability to be able to adapt to different environments. 'The students we worked with, who were studying at the university and a nearby college, ranged from teenagers to students aged in their mid-twenties so they had different abilities and levels of knowledge. Jake, 21, from Sedgefield, who is about to start the final year of his degree this autumn, said: 'To be chosen to go to Kazakhstan and represent Teesside University was exciting. It felt like a real achievement. It provided me with an opportunity to experience another nation's educational system, along with cultural and political differences in journalism. 'I worked alongside Hannah to outline key skills in video journalism such as framing, interviewing and sound quality, skills which all not all students were aware of. Although some of the students had advanced knowledge, others were complete beginners. Teesside University still has places available in a range of courses. More information about how to apply. 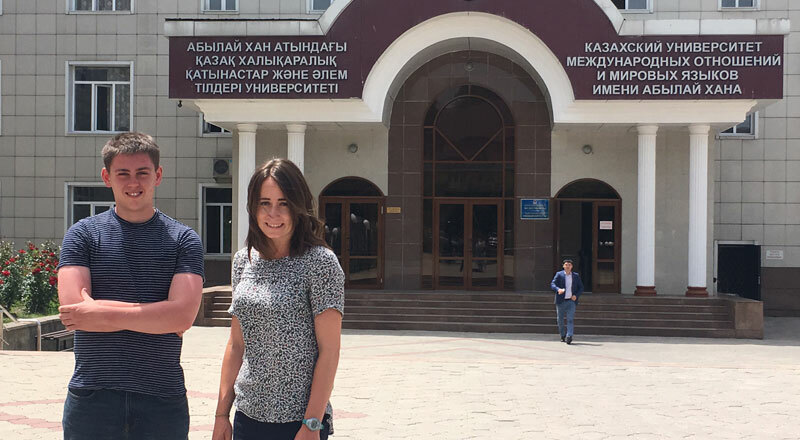 Teesside University journalism lecturer Hannah Mc-Mahon visited Kazakhstan with journalism student Jake Graham, with the pair spending two weeks teaching at an Ablai Khan University summer school.